Text description by the architects. Designed by Allied Works Architecture (AWA), Studio Bell, home the National Music Centre (NMC) is a one-of-a-kind facility in North America. At once a museum, performance hall, live music venue, recording facility, and broadcast studio, the NMC is now also a 160,000 square-foot, state-of-the-art, cultural centre that takes inspiration from the curvilinear shapes of musical instruments, and from the surrounding, indigenous landscape of Calgary, Alberta. Inspired by the light, landscape and geography of the northern prairie, Studio Bell was created to amplify the rich history and future possibilities of Canadian music. The building unique exterior creates a sense of wonder and mystery, inspiring the visitor to explore. The building is alive with the life of music throughout its exhibition, recording, editing, performance and education spaces. The two distinct structures are bound together by a bridge overhanging the city street between them, where moments of silence are filled with light and views out into the city and beyond. The interwoven structure of the building envelops the visitor, with surfaces of metallic and earthen tile crafting an architectural instrument of light, space and music. The selection of the building’s façade material was based both on it’s need to smoothy accommodate the complex wall geometries, as well as have a visually rich quality to magnify the varied natural light conditions of Calgary. The small module and concealed clip system of the Moeding terracotta tile rainscreen successfully achieve the desired smooth surface appearance with the help of Nvelope’s advanced NV1 cladding system. Nvelope was chosen as the cladding system for this unique project for its versatility and range of compatible façade materials. 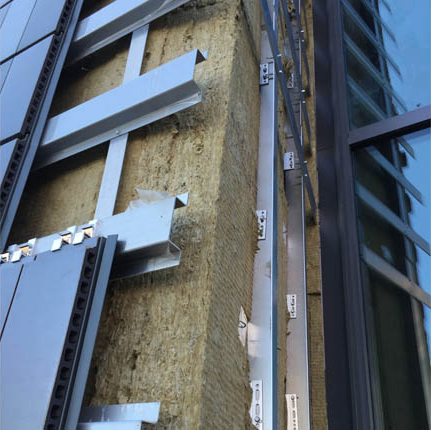 It’s adjustable, face fastening system ensured an easy and installer-friendly experience when bringing to life the NCM’s complex façade. Last, the custom glazes developed by Tichelaar Makkum impart a varied richness that gives the building a dignified presence within its urban landscape. This new facility is an architectural and cultural focal point for the region, incorporating and revitalizing the East Village district while serving as a powerful instrument in its own right, emanating music and light.